This image from the Solar Dynamics Observatory shows the X6.9 solar flare of Aug. 9, 2011 near the western limb (right edge) of the sun. Many storms erupting from the surface of the sun last longer and are more powerful than thought, new research shows. Scientists had regarded solar flares as dramatic one-off events that blaze up and die down in due course. But about 15 percent of them have a second distinct peak of strong energy emission minutes or hours later, and this encore burst often outshines the first, scientists using NASA's Solar Dynamics Observatory (SDO) spacecraft have observed. "This new data will increase our understanding of flare physics and the consequences in near-Earth space where many scientific and commercial satellites reside," Lika Guhathakurta, lead program scientist for NASA's Living with a Star Program at the agency's headquarters in Washington, said in a statement. Solar flares are intense eruptions of radiation from the sun caused by the release of magnetic energy. If a flare is aimed at Earth, this radiation can disrupt or swamp radio signals, affecting communication and navigation satellites. For decades, scientists have observed and categorized solar flares by watching for their emissions in super-energetic X-ray light. The second explosion of many flares generally doesn't occur in X-ray wavelengths, so researchers hadn't picked up on it. But SDO, which launched in February 2010, can see in a variety of wavelengths. 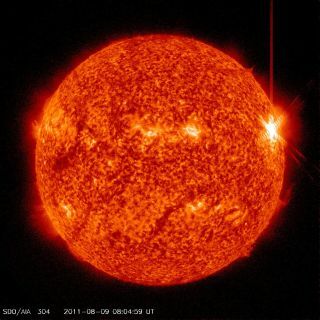 The spacecraft's EVE instrument (for "Extreme ultraviolet Variability Experiment") detected the second burst, which tends to blaze brightly in ultraviolet light. "There's a few flares where the second peak dominates the energy of the total flare system," EVE principal investigator Tom Woods, of the University of Colorado, Boulder, told reporters today (Sept. 7). "But most of the time it's more like 30 to 60 percent more energy in the second peak compared to the first." Woods is lead author of a new paper detailing the results, which came out today in the online edition of the Astrophysical Journal. NASA's Solar Dynamics Observatory spacecraft recorded this solar flare on May 5, 2010. The images on top show the initial magnetic loops of the flare, then a delayed brightening of additional loops. The bottom graphs show the extreme ultraviolet light peaking both in time with the main flare and the late phase flare. Flares can cause problems on their own, but bigger ones also tend to be associated with coronal mass ejections, which can be even more destructive. CMEs are massive clouds of solar plasma that can streak through space at up to 3 million mph (5 million kph). CMEs that hit Earth can wreak havoc, triggering geomagnetic storms that cause disruptions in GPS signals, radio communications and power grids. So getting a better handle on flares — their causes, strength and duration — should help improve space weather forecasts, and perhaps help humanity guard against some of the worst consequences of solar storms. "This extra energy, this extra enhancement is very important in understanding how it affects us here on Earth — the space weather effects on technology and communications and navigation systems, as well as understanding the physics of what happens in Earth's atmosphere," Woods said. That knowledge seems to be getting more necessary by the day. Solar activity has been ramping up over the last few months as the sun has roused itself from an extended quiescent phase in its 11-year activity cycle. The sun unleashed two powerful flares this week, for example — one on Monday (Sept. 5) and one on Tuesday. The Tuesday event was an X-class flare, the most powerful kind. And an X-class eruption last month was the most powerful sun storm since December 2006.